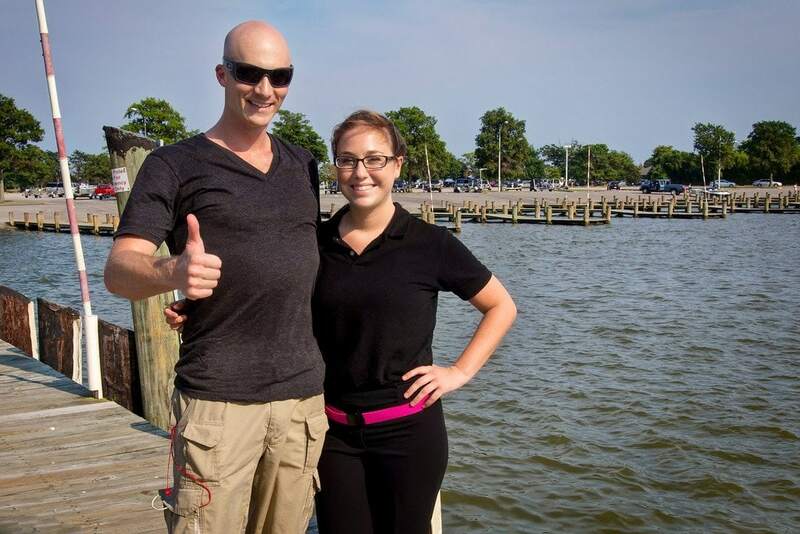 After spending a day touring the capital city of the United States, I hitchhike to the Chesapeake Bay and manage to catch a lift across the water on a boat. Day 34 of my hitchhiking adventure begins in Washington DC. I meet a local guy through Couchsurfing.org who offers to host me at his place and possibly show me around the city. Tanabe lives right outside of DC in Virginia, and he’s an active member in the Couchsurfing community. He picks me up near the White House and we head to his place to drop off my bag, grab a bite to eat, and find an Irish pub to have a few drinks. The following day Tanabe impresses me with his piano skills, then plays tour guide around Washington DC. We spend the morning walking through the National Mall, including a stop at the White House to grab photos with my “Take Me to Your Leader” hitchhiking sign. He was sure I’d be locked up as a lunatic waving my cardboard sign in front of the President’s house. Unfortunately, President Obama wasn’t home that day. It sure would’ve been nice of him to give me a lift out of the city on Marine One! Later that afternoon Tanabe also offered to give me a ride to Annapolis, MD. Dropping me off in the heart of the old city with its beautiful red-brick paved streets and historic buildings. Annapolis is home to the United States Naval Academy and was once a temporary capital of the United States itself. Walking through town I was impressed with all the sailboats and yachts docked around the city. Hmmmm. I’ve already hitched rides on a freight train, a motorcycle, a big rig, and an airplane on this trip… why not a boat? 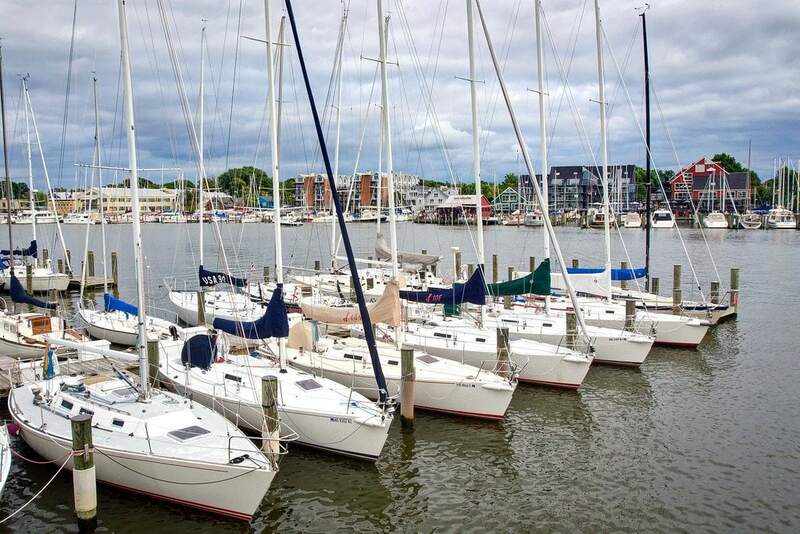 So I spent the afternoon visiting marinas and asking crew-members if anyone planned to sail across the Chesapeake Bay. I wasn’t having any luck though. One captain recommended I check out Sandy Point State Park, where recreational boaters often launch to go fishing for the day. It was getting late, and if I wanted to get near the park before dark, I’d have to jump on a local bus. The bus brought me to a small town called Arnold, where I set up camp in a wooded area behind a Safeway supermarket. Early the next morning I stocked up on food at the supermarket and began making my way down the road towards Sandy Point State Park and the Chesapeake Bay Bridge. Rather than hang out in one spot, I decided to try hitching on the move while walking down the road. It didn’t work very well. Only after 2 hours walking in the hot sun did someone finally stop. 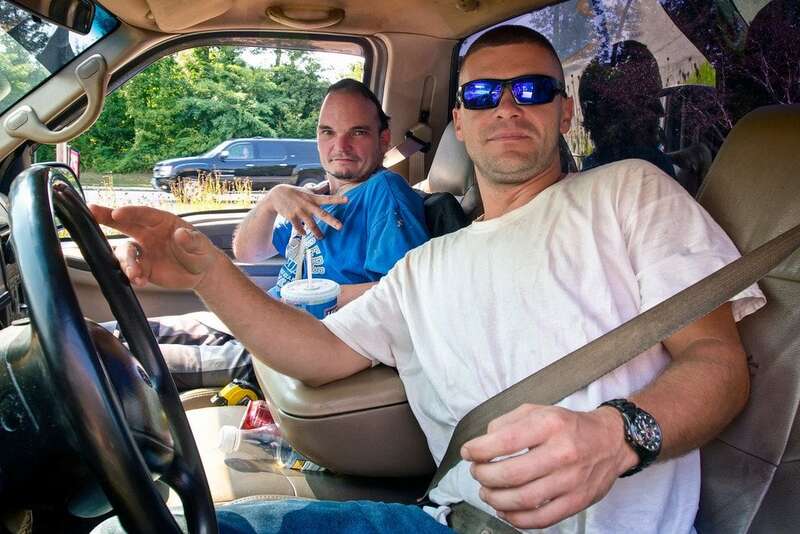 Don & Kevin are construction workers who pulled over in a large pickup truck and told me to jump in back. They then sped off while I held on for dear life. I think they were having a little fun with me. But every ride helps! About 10 minutes later they pulled into a gas station to let me climb out, where I thanked them and asked for a quick photo. So it was back to walking in the hot sun. But only 20 minutes into the walk, I was surprised when a car stopped without warning — as I didn’t actually have my thumb out at the time. Surprise soon turned to shock when a pretty woman rolled down the window and asked if my name was Matthew. Um, yes. Do we know each other? Hell yes! I’d love a ride! Turns out Lisa lives nearby, and was heading to her day job as a waitress. She’d just graduated from college with a degree in Business. She also goes boating on the Chesapeake all the time, and had a special gate code to get us into the park for free. I thanked her for the lift, and she offered to drive me across the bridge if I couldn’t hitch out on a boat. At Sandy Point I found a picnic table near the docks and sat down to scout out potential rides. But it was the afternoon, and rather than boats heading out, they were returning for the day. I managed to ask a few, but none were going very far so they turned me down. Looks like I’d need to spend a night in the park and try again in the morning. I waited until sunset before searching for a good place to hang my hammock out of view of the park rangers. Because camping isn’t allowed in the park. While walking to a secluded section of beach I discovered a whole family of deer munching on grass. They ran back into some trees as I approached, and it was there I found a decent camping spot with a view of the beach and the bay. Early the next morning I snuck into the park’s public bathroom to clean up and shave. I’d need to be presentable for someone to trust me enough to take me out on their boat. While I’ve certainly become better at it on my hitchhiking adventure, I’d still get a bit of anxiety every time. I’d start by complimenting them on their boat, and asking who was the captain (if not already obvious). Mentioning the good weather too, just to get a conversation going. I’d then explain my cross-country hitchhiking adventure, and how I really wanted to hitch on a boat to finish with a great story. Most were intrigued, but not enough to change their plans and take me 4 miles across the Chesapeake Bay. But after getting denied by 5 different boats over 2 hours, Joey arrived. He was launching his speedboat for a day of fishing, preferring weekdays to avoid the busy weekends. Once I assured him I wasn’t carrying weapons, he agreed to change his plans and bring me across the bay. Joey owns 2 very successful funeral homes, affording him the luxury of fishing during the middle of the week. Death and taxes, after all. My hitchhiking journey across the United States is now complete. You can read about the whole adventure using the links below. 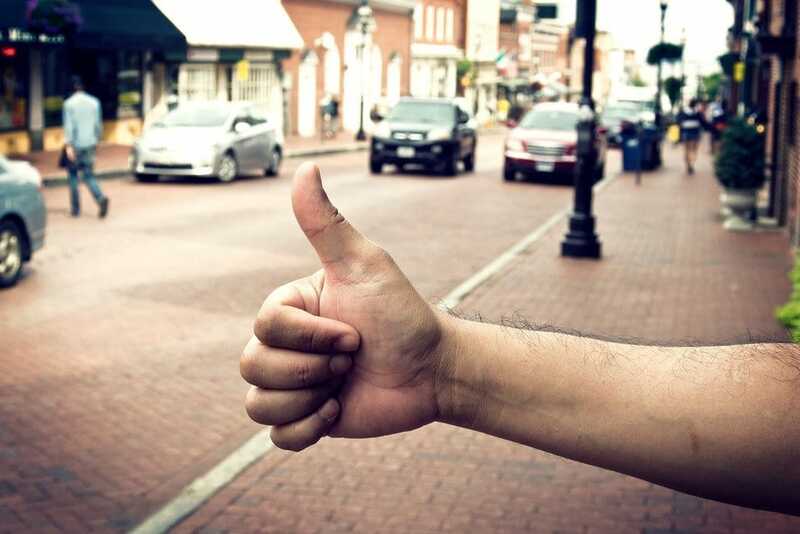 Have you ever been hitchhiking before? Have any questions about it? Let me know in the comments below! You really have hitchhiked on every form of transportation! This.is.amazing!!!! I’ve spent the past couple nights read every post of your hitch hiking trip. Sometimes I wish I was a dude so I could do more things like this and not be as vulnerable. It’s absolutely incredible and inspiring. The connection you can make with people all over the world. Your blog is great. Can’t wait for more posts. I’m kind of slacking on the final few posts, but don’t worry Kate, they’re coming… The person who actually inspired me to take this trip was a 28 year old woman, who hitched and hopped trains by herself! So I say go for it. how cool is it that people get to recognize you and take you along with their mini-adventures? Awesome! I wasn’t expecting it at all. She sure saved me too — I was dying out there walking in the sun for so long. Hey man, first off great site, been researching alot and yours seems to be the most realistic look into the lifestyle which excites me, I would be happy if we could exchange emails on a few tips but I do understand if u can’t. However , this trip looks amazing, I’m curious as to how much your budget has been, and how long is it, if u don’t mind me asking ofcourse. Hi Ray! You can always get a hold of me on my contact page. The hitchhiking trip lasted 5 weeks, although I took my time in some places, so it could have been quicker if I pushed it. Haven’t worked out the exact budget yet, but I think it was around $500. I did stay at a few hotels and eat out occasionally. You could do it much cheaper if you wanted to, really just the cost of food if you’re stealth camping or couchsurfing. Lisa the waitress is a real dish; compliments to the chef. Love your site, it’s become a must read for me. One more story left before the adventure concludes. Had a great time.